Windows OS Hub / News / Vembu BDR Suite v3.9.1 Released: What’s New? Vembu BDR Suite v3.9.1 Released: What’s New? Last week Vembu company announced the release of the latest version of its flagship product for data protection – Vembu BDR Suite version 3.9.1. The main change that has appeared in the new version of the product is a new licensing model. Now, in addition to the free edition (backup limitation for up to 3 VMs and no replication) and Enterprise Edition, a new edition has appeared – BDR Suite Standard, which is primarily focused on small businesses. In the Standard edition, there are no functions for configuring the replication of virtual machines, which are usually not used in SMBs. Now customers have the opportunity to choose a BDR edition in accordance with their business perspective, and the option to protect their virtual environment at a lower cost. As before, BDR Suite is licensed by physical host processors. If you have a server with two physical processors, you will need to purchase two licenses to license this host, regardless of the number of cores on each processor. When buying a bundle of 6 licenses, Vembu offers additional discounts (you can get at almost 50% discount). Quick VM Recovery for ESXi – Previously, a quick VM recovery was only available for Hyper-V. Now backups can be restored as a virtual machine by downloading the backup machine directly from the repository, to any hypervisors (Hyper-V, VMware ESXi or KVM). Native Tape Storage Support – Added additional media types support, now you can apply more backup strategies. Backup-level Encryption for all agents – Now you can encrypt your backups with the help of AES-256 bit encryption algorithm. For more information on the difference between versions, you can download the PDF file on the Vembu website. 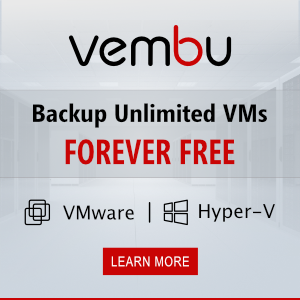 Also you can use the free 30-day trial version of Vembu BDR Suite with full functionality without restrictions (Vembu BDR Suite Download).